Purple piece of glass was found in December 2010, on Fortescue Beach in New Jersey. It was cold and the top half of the beach was snow covered. That is a great find. Just found a store in Rock Hal, MD where they make up beautify pull jewelry from seaglass. Thats a real treasure, fabulous!! 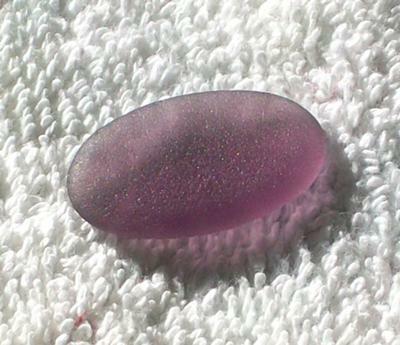 It was hard to tell the size but what a beautiful piece of purple sea glass. How exciting for you to find it. Congratulations! This is a fantastic find, not only the rare color but also the perfect jewelry grade A condition!! And nice photography.